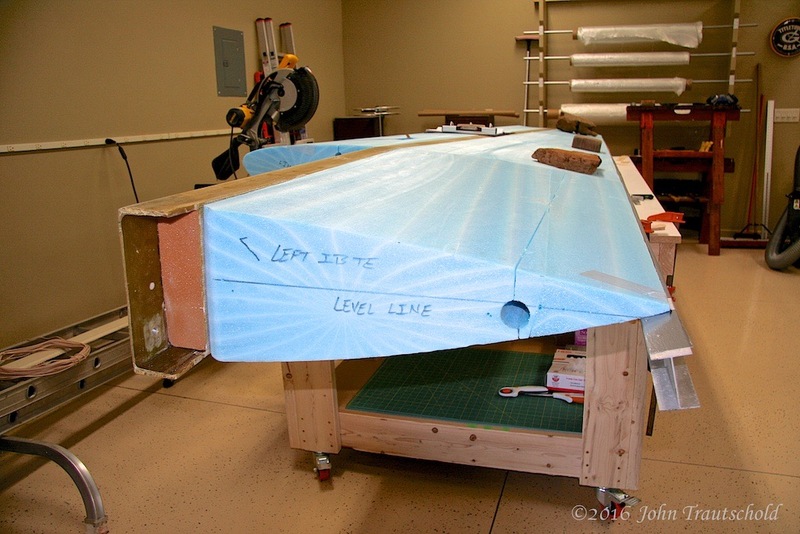 The next big step in the process of constructing wings is applying the fiberglass skins to the foam cores and the spar. Before doing that, there’s a lot of prep work that needs to be completed. All of the gaps need to be filled in with slurry and everything, and I mean everything, needs to be sanded as smoothly as possible before applying the fiberglass. I’m told that it’s much easier to sand and smooth everything now than it is once the fiberglass is down and cured. It’s really important to get all of this right! Earlier in the process of constructing the wings, I needed to make sure that everything was level. Here though, we’re just making sure that what was level before, while gluing up the cores, is still level before applying the fiberglass. Once that’s down and cured, it’s very hard to fix any problems! I need to start by laying the wing (in this case, starting with the left wing) back down on the table with the top of the wing down. It needs to be shimmed into place so that it doesn’t move. 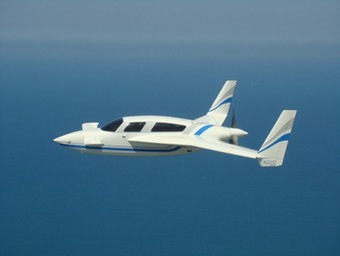 I also need to use one of those handy I-Beams that Velocity supplies to perfectly align the trailing edge of the wing. Here’s a photo showing the left wing on the table. And yes, those are local rocks (we have plenty of them here in the mountains of AZ!) being used as weights! 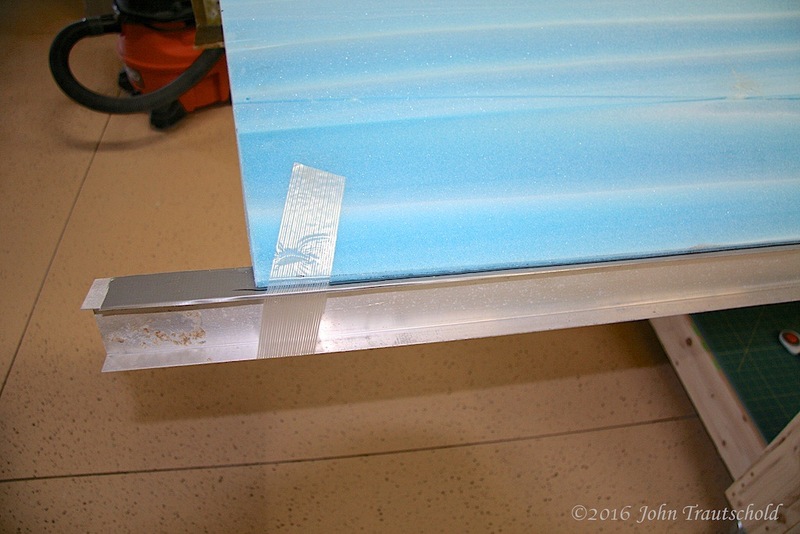 And here’s a closeup shot showing the trailing edge resting on the I-Beam which is also shimmed at an angle to support the trailing edge properly. The next step is to fill in all of the gaps with a Micro-Balloon epoxy filler, then sand and fill and sand and fill and sand some more to get everything is smooth and flat as possible. Click here to load the next page!